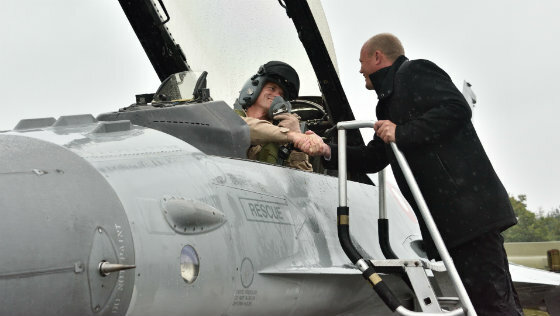 The new defence minister, Peter Christensen, was at hand at Skrydstrup Air Force Base in Jutland yesterday to welcome home the Danish F-16 squadron as it returned home from its mission against IS in Iraq. The squadron deployed for Kuwait this time last year, which has been bombing targets in Iraq ever since, was withdrawn because it is in need of a break. “Our Danish pilots, mechanics and other staff undertook a huge task and completed it excellently,” said Christensen, who assumed the reins as defence minister following Carl Holst’s resignation last week. Christensen stressed that the F-16 squadron was likely to be redeployed sometime in 2016. Meanwhile, Denmark revealed in late September that it had decided to use mobile radars to supplement its efforts as part of the coalition against IS. In related news, Belgium and the Netherlands look set to become the latest two nations to sign up for the Danish-led Smart Defence project regarding the joint acquisition of precision guided munitions. At a NATO meeting today, both nations underlined their desire to join the project by signing letters of intent. Denmark, Spain, Portugal, Norway, the Czech Republic and Greece have already signed on. “Co-operating on the acquisition of military capabilities can help to ensure a greater impact for the same or fewer resources and thus help NATO to better address the security challenges as an alliance,” said Christensen.